The Max’s had a giant cedar home in snoqualmie that they have been wanting to restore for many years, they finally decided to bring back their cedar home to new condition. 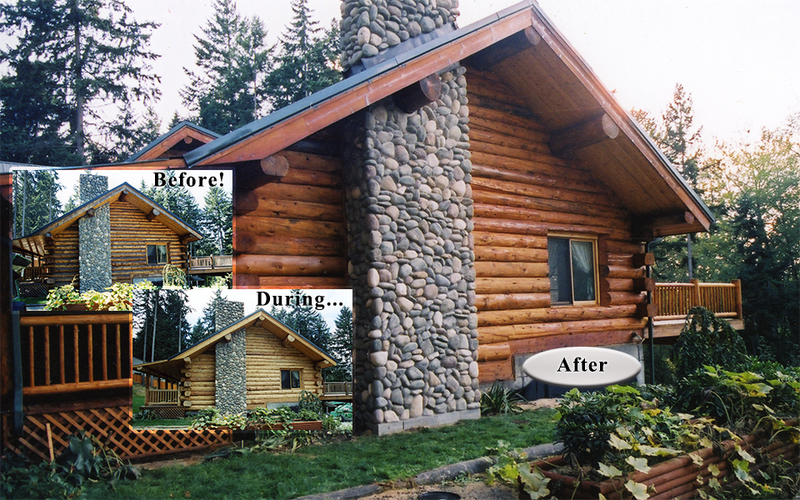 We went right to work washing the cedar home with Lovitt’s Cleaner and Brightener. Here is the side of the house after the washing portion with Lovitt’s Cleaner and then brightened/neutralized with Lovitt’s brightener. Here the cedar home is masked off and ready for spray application of 2 coats of Lovitt’s Natural Gold wood finish back-brushed into the wood until the siding will not accept any more finish. Lovitt’s is a deep penetrating quality finish that protects the wood from the inside out. Lovitt’s Natural Gold oil based wood finish is now being applied using a low pressure sprayer, this home is receiving the Lovitt’s with the Natural color tint added. The next day, the second coat is going to be applied to the cedar siding, and then the trim will be painted green to match the deck. We make sure all the wood has been saturated and the finish back-brushed well and all drips cleaned up prior to removing the masking film. Our crews take great pride in protecting the landscaping and surrounding area from overspray during this step of the process.